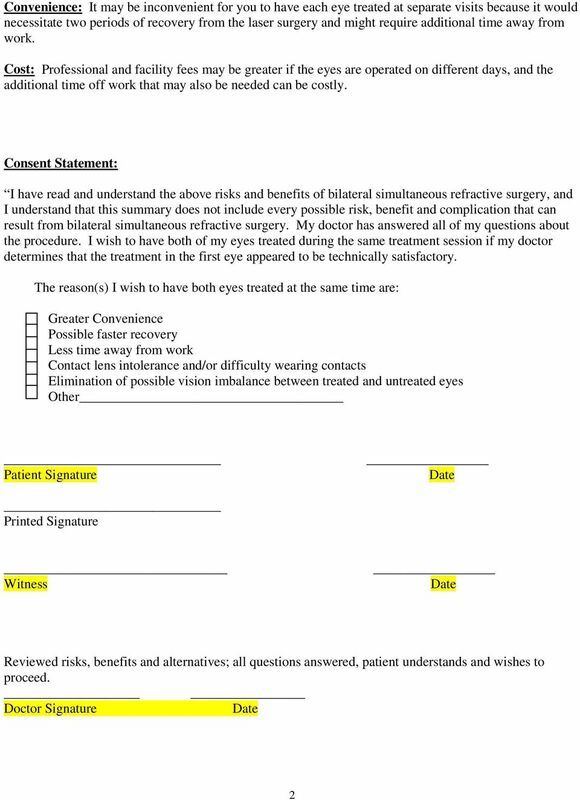 Download "Consent for Bilateral Simultaneous Refractive Surgery"
1 Consent for Bilateral Simultaneous Refractive Surgery Please sign and return Patient Copy While many patients choose to have both eyes treated at the same surgical setting, there may be risks associated with simultaneous treatment that are not present when the eyes are treated on different days. 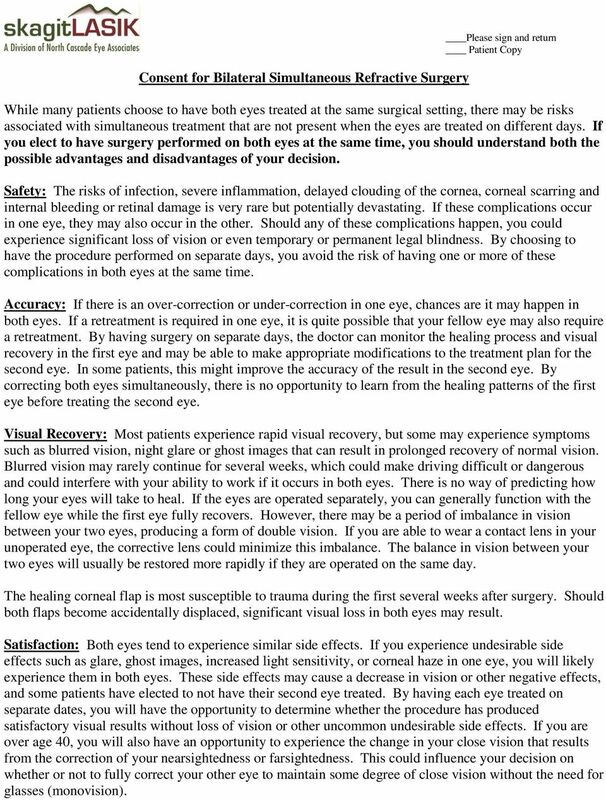 If you elect to have surgery performed on both eyes at the same time, you should understand both the possible advantages and disadvantages of your decision. Safety: The risks of infection, severe inflammation, delayed clouding of the cornea, corneal scarring and internal bleeding or retinal damage is very rare but potentially devastating. If these complications occur in one eye, they may also occur in the other. Should any of these complications happen, you could experience significant loss of vision or even temporary or permanent legal blindness. 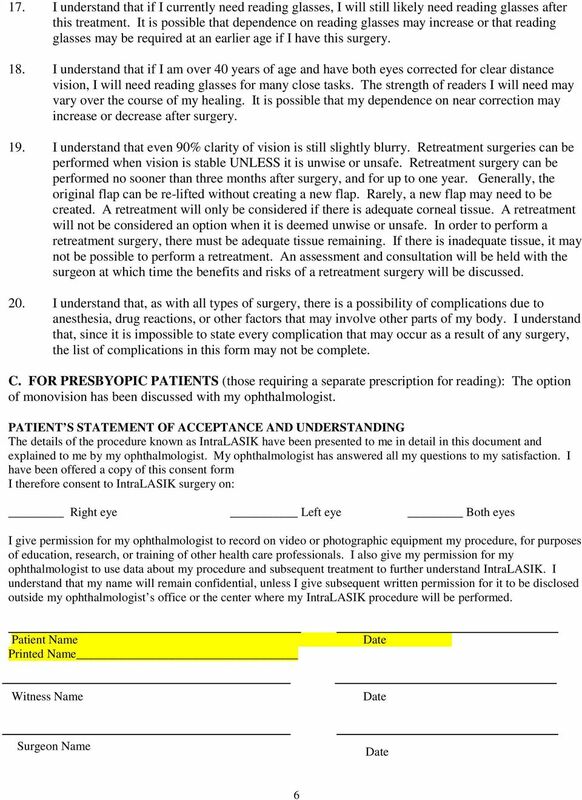 By choosing to have the procedure performed on separate days, you avoid the risk of having one or more of these complications in both eyes at the same time. Accuracy: If there is an over-correction or under-correction in one eye, chances are it may happen in both eyes. If a retreatment is required in one eye, it is quite possible that your fellow eye may also require a retreatment. 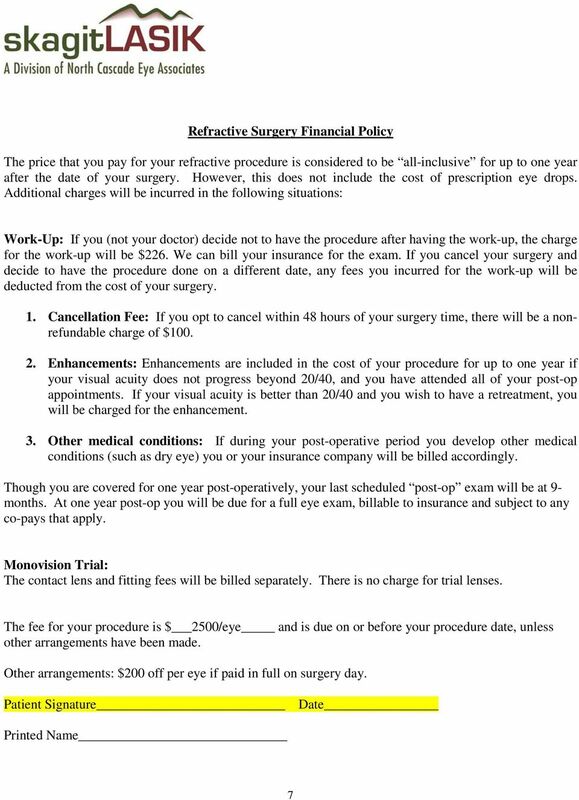 By having surgery on separate days, the doctor can monitor the healing process and visual recovery in the first eye and may be able to make appropriate modifications to the treatment plan for the second eye. In some patients, this might improve the accuracy of the result in the second eye. By correcting both eyes simultaneously, there is no opportunity to learn from the healing patterns of the first eye before treating the second eye. Visual Recovery: Most patients experience rapid visual recovery, but some may experience symptoms such as blurred vision, night glare or ghost images that can result in prolonged recovery of normal vision. Blurred vision may rarely continue for several weeks, which could make driving difficult or dangerous and could interfere with your ability to work if it occurs in both eyes. There is no way of predicting how long your eyes will take to heal. If the eyes are operated separately, you can generally function with the fellow eye while the first eye fully recovers. However, there may be a period of imbalance in vision between your two eyes, producing a form of double vision. If you are able to wear a contact lens in your unoperated eye, the corrective lens could minimize this imbalance. The balance in vision between your two eyes will usually be restored more rapidly if they are operated on the same day. 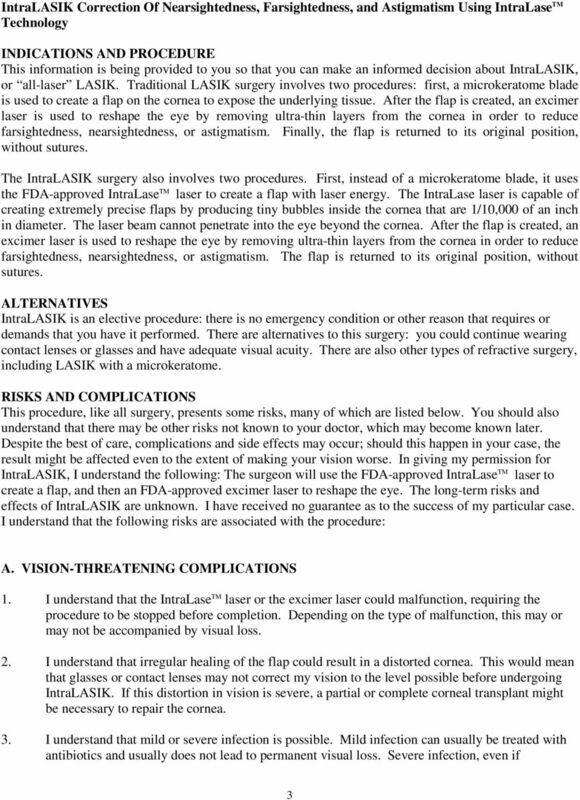 The healing corneal flap is most susceptible to trauma during the first several weeks after surgery. Should both flaps become accidentally displaced, significant visual loss in both eyes may result. Satisfaction: Both eyes tend to experience similar side effects. If you experience undesirable side effects such as glare, ghost images, increased light sensitivity, or corneal haze in one eye, you will likely experience them in both eyes. 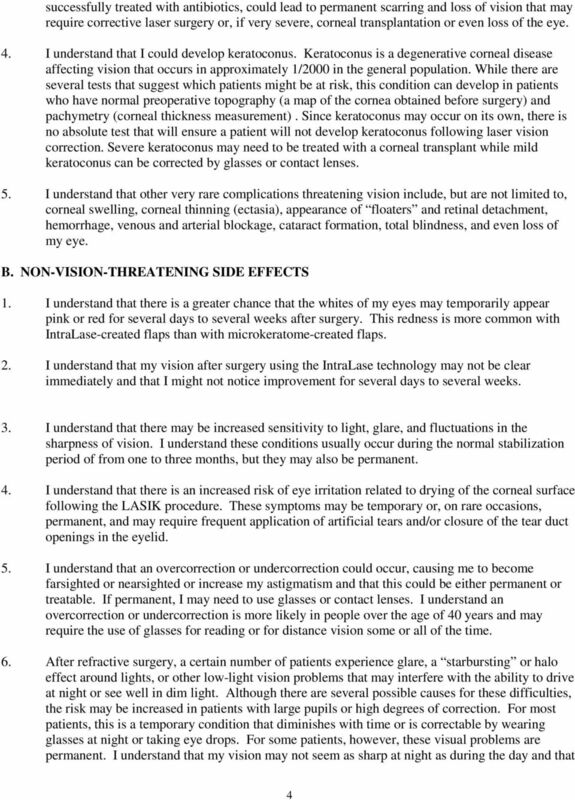 These side effects may cause a decrease in vision or other negative effects, and some patients have elected to not have their second eye treated. 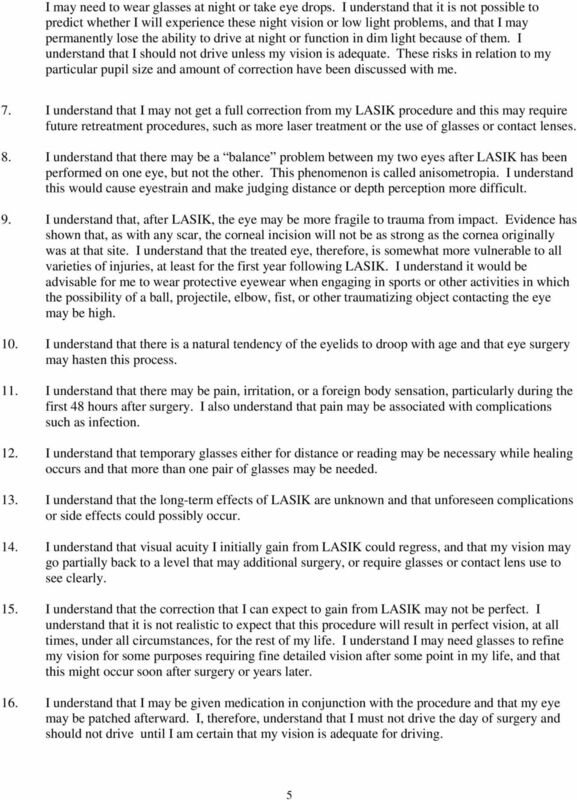 By having each eye treated on separate dates, you will have the opportunity to determine whether the procedure has produced satisfactory visual results without loss of vision or other uncommon undesirable side effects. If you are over age 40, you will also have an opportunity to experience the change in your close vision that results from the correction of your nearsightedness or farsightedness. This could influence your decision on whether or not to fully correct your other eye to maintain some degree of close vision without the need for glasses (monovision).